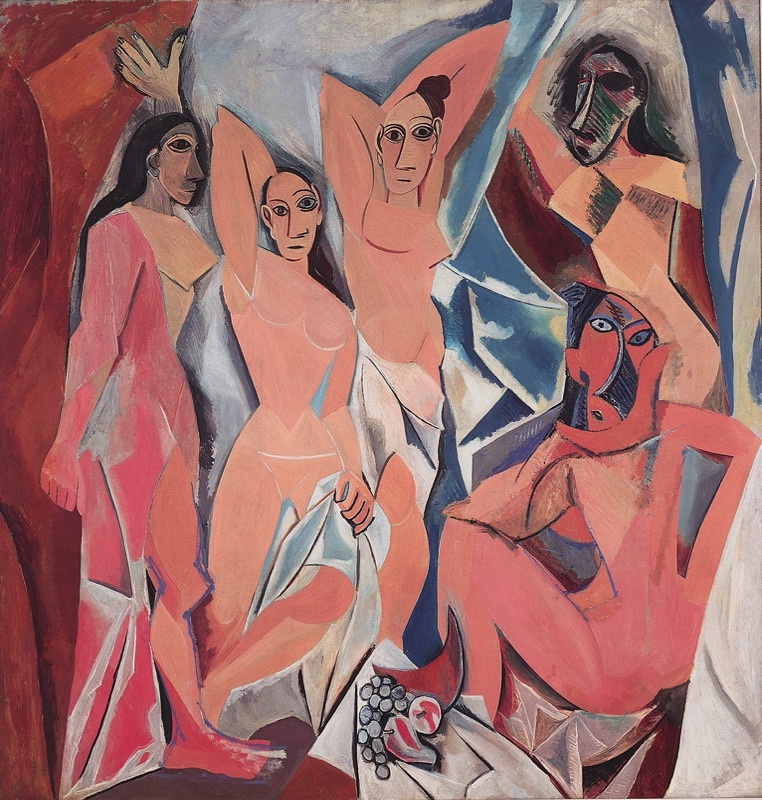 Picasso's Demoiselles began as a more or less ‘expressionist’ work: a modern vanitas painting, warning viewers about the dangers of prostitution. 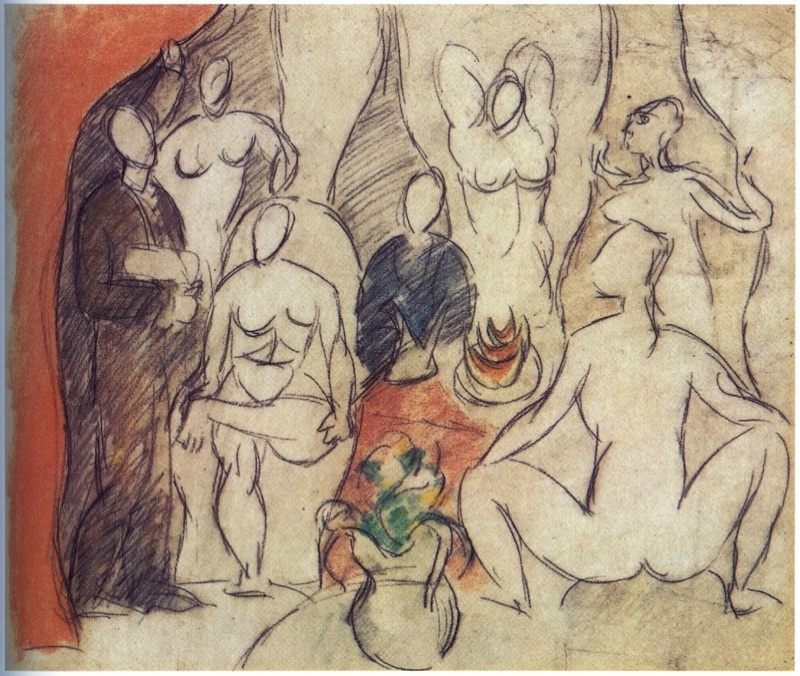 Be able to analyze the work along these lines, including the evolution of Picasso’s ideas through his many preliminary sketches for the work, and his innovative use of both subject matter (such as the African masks) and form (especially line and shape) to replace the vanitas emblem of traditional still-lives. A second level of significance in the Demoiselles is the way it begins to point the way toward the movement that would later be called analytic Cubism. 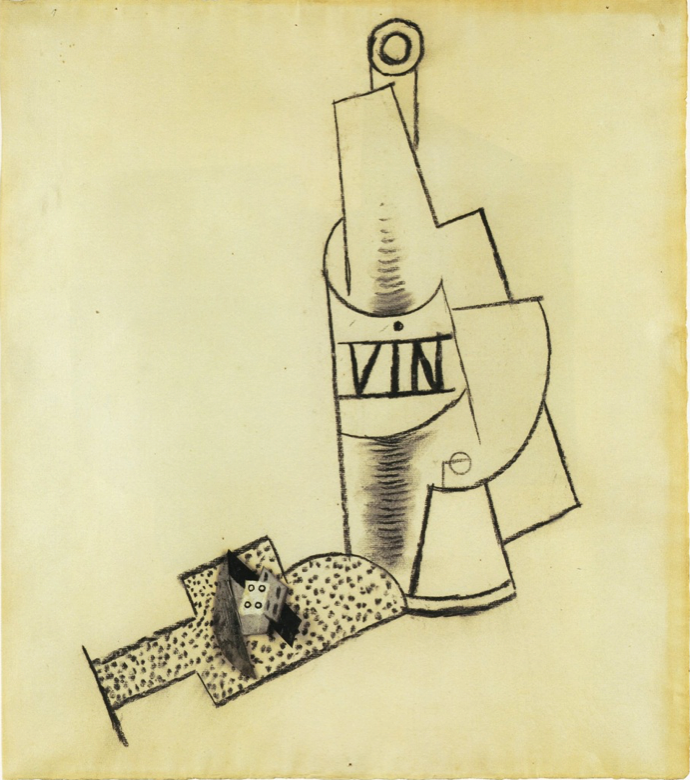 This is most obviously visible in the way the work breaks its depicted objects into hard, flat, angular facets -- but more significantly in the way it begins to show Picasso using multiple perspectives: that is, representing a given object from multiple points of view at the same time. Where is this visible in the Demoiselles? The use of multiple perspectives is anathema to conventional, naturalistic art, but we saw it already in Cézanne, and indeed multiple perspectives have been used for far longer and by far more periods and cultures than one-point perspective. Most primitive and non-Western cultures regularly use multiple perspectives, as do children and folk artists all around the world, and indeed most periods of Western art other than the Classical period of Ancient Greece and Rome and the five hundred or so years since the Renaissance. Why did all of these different periods and cultures freely use multiple perspectives? (Hint: it has to do with drawing what you know, rather than what you see). The idea that Cubism, despite all appearances to the contrary, is more true to reality than conventional naturalism is what the Olivier-Hourcade and Rivière articles are all about. Why is painting from multiple perspectives more true to reality than painting from only one? In what way(s) does traditional perspective distort objects? What perspectives should be chosen if your aim is to paint the ‘truth’ of the object? How do the works below demonstrate this principle of drawing the known truth through multiple perspectives? Why, according to the readings, did the Cubists not only reject perspective, but also color and the use of a consistent, single source of light? Now think about this: in what sense can both Impressionism (and neo-Impressionism) and Cubism both be cited as ‘realist’ movements -- albeit in very different ways? What did each movement understand by ‘reality’ and how did each attempt to be faithful to it? Finally, we looked at the evolution of analytic Cubism into the nearly abstract style of hermetic Cubism, where you can barely see the object being represented in the mess of fragments; indeed, it is only a few pictorial clues that let you make a guess whether the object is a person or a still-life. 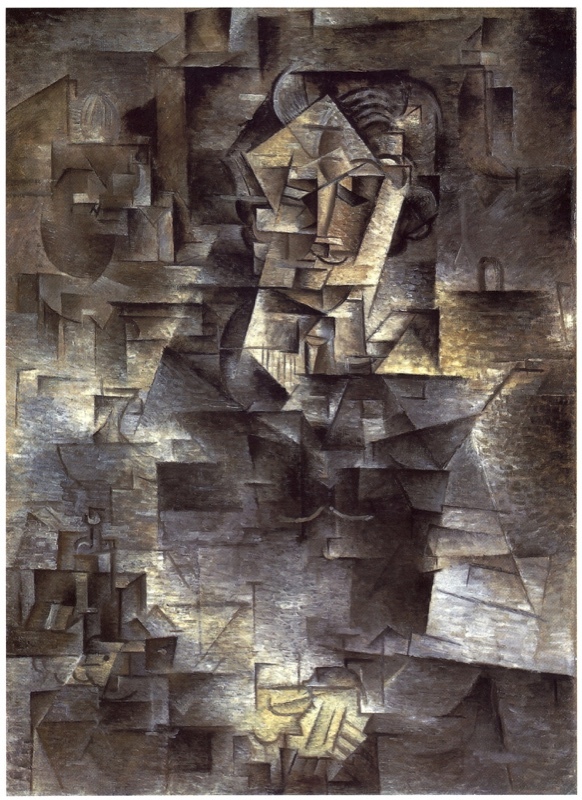 What 'clues' can you see in the Picasso portrait of Kahnweiler, below?